Well, I certainly hope you all did better this month than I did! I knew a slow month would hit me sooner or later, and this was one of them. I only completed 4 blocks this month . . .
That makes my total number of blocks for the year: 185. But since our goal so far is only 110, I’m still ahead. However, if I have many more months like this one, I won’t be for long! It’s time to comment or contact me to let me know your updated totals for April. Our new goal for May is 140. I’ve updated the Project page to reflect that, and as your totals come in, I’ll get them posted there as well. I hope your stitching is going well! If you have any pictures posted on your own blogs, be sure and leave us a link so we can go look at what you’ve been up to — I love seeing pictures of everyone’s works in progress! It’s never too late to join in — we’re up to 68 participants this year! You can read about how the project works by clicking HERE. I hope you’ll consider joining us. There are monthly prizes, and we’ll have grand prizes at the end of the year as well. I pieced a t-shirt quilt, so I don’t know how to count that one. I also completed 17 more 9-patch in a star blocks. All the 9-patches were finished, but I don’t remember how many I had already counted. So I guess just put me down for 17. Add 42 more, as I forgot about a nickel and dime quilt. I also finished a rick-rack 9-patch, but I don’t remember how many 9-patches I made this month. April Total = 41, but I have 130 for the year, so far. P. S. I like your Ferris wheel blocks. Put me down for 24 this month. Three of those were large table runners that I counted as one block each. I didn’t concentrate on the 9-patch stars for the guild challenge……….which would have given me another 12. That is one big quilt, however, and it will all have to be set together. So won’t get much to count in May either. Which is what I did mostly this month. Set together the Edina Raffle quilt last Monday. With help from my friend Kay and also Anita and Barbara from Edina. Put me down for 76 blocks. I am pretty happy with myself this month. 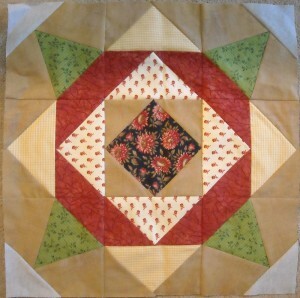 I got 41 done this month–32 block a day stars, 7 spools, and the 2 tell it to the stars blocks. By the skin of my teeth I finished up 30 9-patch blocks today. That makes my total for the year 177. Fortunately, I still have some move 9-patch blocks to make so those will be good for part of May’s goal. I love your Ferris Wheel blocks! Beautiful! Sorry, but I didn’t get any done this month 🙁 Just can’t seem to find the time or desire to do any these days. Hoping May will be better. I finished 37, for a total of 207! Although I was busy sewing all month – I only made 18 blocks. Hopefully, I will get to sew more blocks in May and less other items, but when the daughter-in-law says Mavis needs some pants – Mimi fires up the sewing machine and out comes 4 new pairs of pants. Also made a purse for my other daughter-in-laws birthday and a few baby shower items. I had 56 blocks for April. They sure add up fast when you’re counting. It makes me feel like I’m accomplishing a lot. Thanks for the opportunity to participate. Put me down for 66 blocks for April. A whole whopping 18…no snow days = very few sew days I am afraid! I only got 24 blocks done in April. I did get my Quilt of Valor top finished with borders and also quilted a wallhanging with crumb pieced heart on it. I am still stitching down the binding. It was a good sewing month I think, even though not too many blocks got done. I finally counted up my blocks. Since I haven’t reported I just counted everything since January. I have made 254 blocks including January. Whew! I got 38 blocks done this month. I’ve never actually kept track of how many blocks I do, so this was an eye opener for me. I’ve posted at my place about this and I have pictures too. My count for April is 38. Have a great day! 30 Farmer’s Wife Blocks and 12 of another project. I did finish 3 other projects, so I am happy with my progress. There is always the next month to do better. Slow reporting more slow sewing. Sixteen blocks for me in April, but May is looking much more promising. I completed 53 blocks in April! Woot woot! That gives me a total of 171. Thanks for inspiring us to complete-complete-complete! The count for April is 113.